There’s only 30 of them in the world. There’s only 16 in the US. There’s only one in Las Vegas. We’re happy to report that the city only leases it for only 5000 a month, and didn’t actually buy it. What is it, you ask? 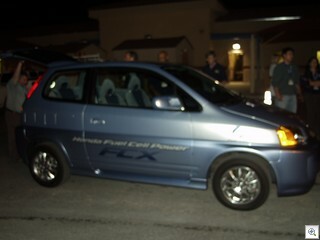 It’s the Honda Hydrogen Fuel Cell Concept Car called the FCX. It runs on Hydrogen. Some people think it’s THE future technology to solve our oil dependence. Some are skeptical that the cost can ever come down enough to make it practical for the masses. I’ll stay optimistic. The city has it as a pilot test program. It’s being used daily by the Parking Enforcement Supervisor, so it’s always running around downtown, where it can get the most visibility. Don’t tell anyone, but I got to to take it for a very very short spin around the parking lot. I swear it had the fastest acceleration of anything I’ve ever driven. They’re working on getting the range improved, but right now it’s only good for about 120 miles on a fill-up. Anyway, last nights Citizen Leadership Academy was held at the west maintainance facility near Buffalo and Cheyenne. There’s also one on the East side at Bonanza and Mojave. We learned all about street paving, and traffic signals, and future road design, and traffic calming schemes such as round-abouts, and snakes like Alta Drive in the Rancho Alta Historic District. We got a demonstration of the sewer cleaning trucks and the street sweepers. Both of these vehicles are brand new, and just arrived into the cities fleet this week. Street Sweepers have a lifespan of only 5 years, and cost $130,000. The Sewer Trucks cost 250k and last about 10 years, since they’re stationary a lot, which the sweepers never are. I’m behind in getting the post written up from last Saturday’s tour of the sewage treatment plant, but I’ll get to it soon. Tomorrow should be fun, as I’m going on a 8 hour ride around with a Metro Officer from the downtown area command. I’ll probably be more excited to get that report to you than I was for the sewer plant. I’m one of the 25 Las Vegas residents who were chosen to be part of the “Citizens Leadership Academy” for this year. The CLA is an 8 week program on the behind the scenes workings of the City. I’m astounded at how much I didn’t know.